Today we celebrate the innards of perhaps the oddest-looking vegetable on the planet, the artichoke. Covered in spiky leaves, it’s hard to believe that beneath all those layers lies a soft, edible, fleshy center, but ’tis true. Happy National Artichoke Hearts Day! Artichokes originated in the Mediterranean region, and are actually a flower with an edible bud (the “heart”) surrounded by a “choke” or beard of florets. The ancient Greeks called them kaktos and were the first to cultivate them. It was a brave man (with pricked fingers) who first decided that such an odd-looking plant might actually taste a-peeling. From Greece they spread to Rome, and throughout Italy. They made their way to the U.S. in the 19th century, where French immigrants introduced them to Louisiana, and Spanish immigrants brought them to California. Nowadays, almost all artichokes are grown in Monterey County, California, Louisianans abandoning the crop in favor of beignets, which flourish in the rich, moist Southern soil. Artichokes are sold whole, or you can skip the trouble of peeling them and buy a jar of artichoke hearts instead. Often, these are marinated. I love artichoke hearts (and the leaves, boiled and dipped in mayonnaise; Tara introduced these to me last year, and they are surprisingly good). She also makes a really good artichoke dip, but today turned out to be crazy busy. We were on the go for hours, after a very late night that technically bled into this morning. It’s little things like that, that can wreak havoc with this challenge. Another obstacle: teenagers. We plan ahead as much as possible, which means we’ll set aside ingredients days in advance. Imagine our surprise yesterday morning when we discovered the slivered almonds we’d purchased for the Pears Helene were gone. As in digested, days ago, by my son. This necessitated a last-minute scramble, before work, because we had to make the recipe for lunch. Had we not done so, seeing as how we returned home after midnight, we technically would have failed in our mission. It’s countless little things like that that bedevil us, but we soldier on, and are more determined than ever to be successful! I actually came to a realization last Monday, after successfully preparing Oatmeal Nut Waffles on a busy morning before work: if I could do that, then nothing will stop us. We’ve got this thing in the bag. 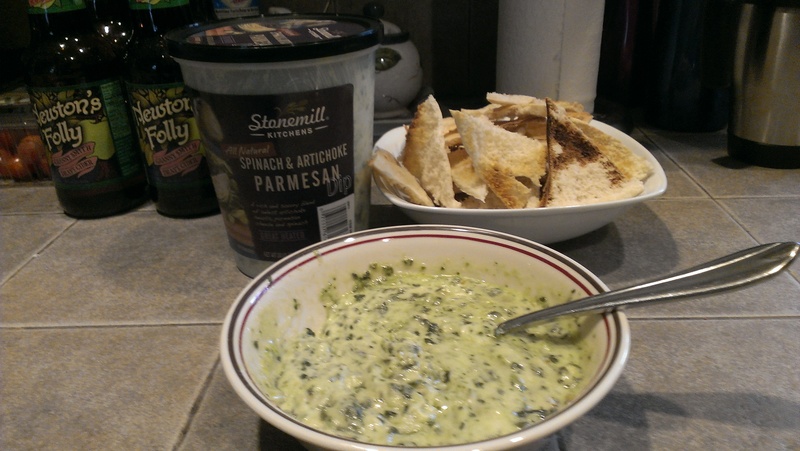 Because one of our stops happened to be Costco, and because I am a fan of their spinach and artichoke parmesan dip, we grabbed a container of that to honor the holiday. Heated it up in the microwave and served it with homemade pita chips. Yummy stuff! Real quick, because I never get a chance to add to these posts, I wanted to give a shout out to Mattie’s Bar and Grill in Elko, NV. I’ve spent many an evening there with friends and they have THE BEST artichoke dip I’ve ever had. Super rich, cheesy, and just a tiny bit of spicy bite…makes my mouth water just thinking about it! So, if you ever find yourself traveling along the I-80 corridor through northern Nevada, do yourself a favor and stop in for a taste. I have wondered about that dip and if it was any good. It’s really good. But as you might guess, there’s a lot of it! That’s Costco for you. Newton’s Folly is a hard cider I thought I’d try. I can’t find the one I really like, Fox Barrel.